On Saturday October 27th we’re hosting a spooky Halloween themed Paint & Sip Art Class at the brewery. Each ticket includes a flight of Ravens beer and a 2 hour art class, at the end of which you get to take home a painting of your very own! Tickets are on sale now! Get them here. An old classic has undergone a bit of a facelift. Our English Dark Mild has a new look and a new name. 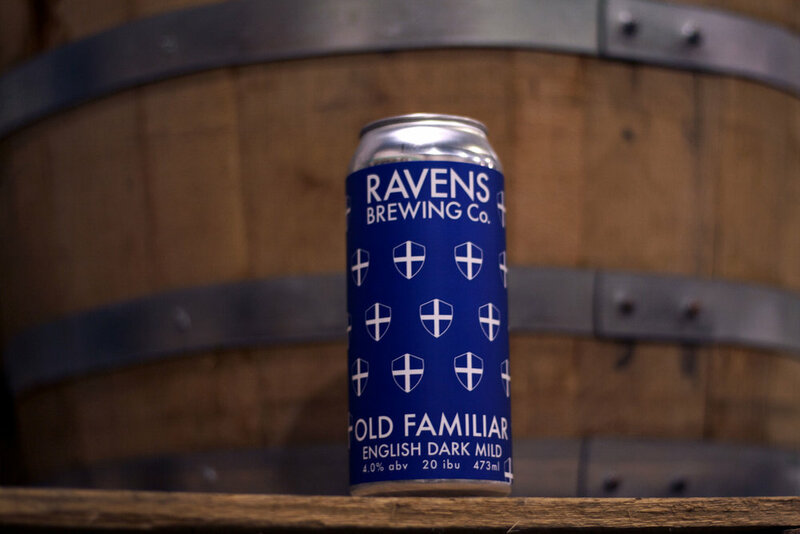 Say hello to Old Familiar English Dark Mild! We wanted to give this beer a name that represented its character. It’s like an old friend, a soft blanket on a rainy day; warm, cozy, familiar. It also sounded very British. So British, in fact, that it could be the name of your neighbourhood pub. Now Available in 473ml Cans. 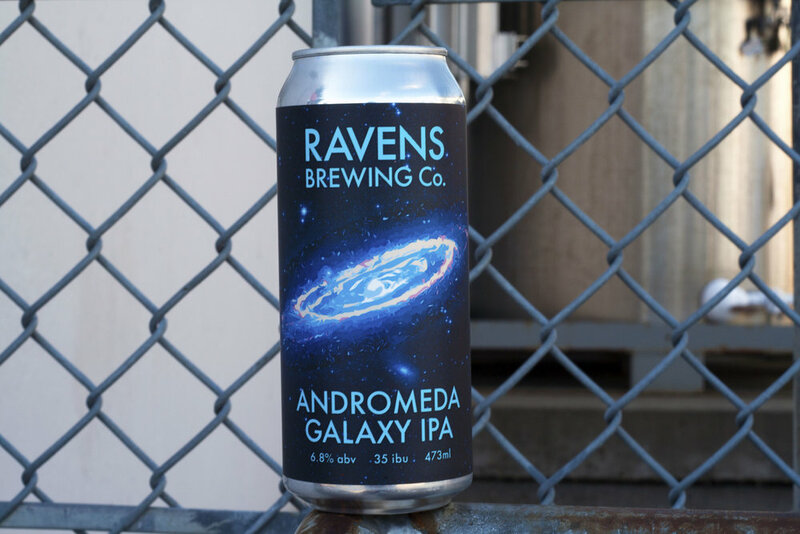 Andromeda Galaxy IPA is back! Andromeda Galaxy IPA is making its long awaited return! This beer was brewed using a whole lotta Galaxy hops giving it a smooth, juicy flavour with just a bit of bitterness on the finish. We’re very excited to be bringing this beer back. It will be available in 473ml cans and on tap. Ravens Brewing presents the latest entry into our Sour Series, Mórrígan Stone Fruit Sour. Brewed with Apricots, Peaches, & Plums, Mórrígan is a lightly tart, refreshing sour ale loaded with juicy fruit flavours. It is available in 650ml bottles and on tap. Ravens and Doan's Colab Excitebeer! Ravens Brewing has announced the release of a new beer brewed in collaboration with Doan’s Craft Brewing. Excitebeer is a refreshing and tart beer. A lightly soured beer with lemony-citric fruit sharpness and very little hop bitterness. An excellent introduction to soured beers and the perfect beer to pair with summer. Excitebeer will be available on Friday July 20th at both Ravens and Doan’s, and in local bars and private liquor stores starting next week. Abbotsford has a long, rich history as a food producing community. We want to pay respects to the agricultural roots in our city. Our West Coast Pale Ale is brewed using 100% Abbotsford grown hops. It's our small way of paying tribute to the history and traditions of the community we are a part of. During Taste of Abbotsford week we are offering $1 off all bottles and cans of West Coast Pale Ale. We'd like to introduce you to all of the members of out fantastic team! Over the next few weeks we'll introduce you to everyone on the team, from the people who pour your flights for you to the people who toil tirelessly behind the scenes to make sure every batch of beer is brewed, packaged and shipped properly. This list starts off with two people our regulars will be quite familiar with and ends with a guy you may not be too familiar with. Although, you may have caught a glimpse of him running up and down the brew house stairs on occasion. She works behind the bar on weekends and as a sales rep during the week. Her favourite beer is the Kolsch from Chuckanut Brewing. Fun Fact: She dies her hair a different colour about once a month. She's also one hell of a goalkeeper. Noel is one of our key front of house/event staff. His favourite game is Super Smash Brothers. Interesting fact, if you have ever seen the Save on Foods 100th anniversary truck that is his design. Thanks Noel, for being part of the conspiracy. Our trusty assistant brewer works hard behind the scenes to make sure every batch of beer turns out perfect. He is a graduate of Kwantlen Polytechnic University's Brewing Program. His favourite beer is Val-Dieu Grand Cru. Thanks for all your hard work, Nathan! Ravens Brewing Company claimed a gold award in the 2018 World Beer Cup, a global beer competition that evaluates beers from around the world and recognizes the most outstanding brewers and their beers. We are happy to announce that in conjunction with VBW's LIft Off! event we will be releasing our new Andromeda Galaxy IPA on Saturday March 3, 2018. Searching for a balance between the North East and West Coast IPA's we have crafted our Andromeda Galaxy IPA. A 100% Galaxy hopped IPA with moderate bitterness, a soft mouthfeel, and an abundance of citrus and tropical fruit flavours. Huginn & Muninn coming February 23rd! Next Friday we are releasing the latest editions in our Sour Series, Huginn & Muninn. Two dark, sour beers; one aged in Oak wine barrels and one infused with Black Currant. Both beers feature a rich and complex flavour profile with notes of Oak, Tannin, Dark Fruit, Tartness, and Wine characteristics. They will be available at the brewery on tap and in 650ml bottles. Stay tuned to our social media for more info about upcoming releases. We're launching our first two Dark Sours later this month: Huginn & Muninn. Named after a pair of ravens from Norse mythology that fly across the world and bring information to the god, Odin. Huginn was aged in Oak Wine Barrels and Muninn was infused with Black Currant. Stay tuned to our social media pages for more info on the release in the next few weeks. It's finally back! The long awaited return of the Oldhand Coffee IPA is here. It will be on tap and in 473ml cans. Plus, we'll have some tasty goodies from Oldhand at the brewery to snack on with your beer. Check out the Facebook Event Here. It has become an annual tradition for us to team up with our friends at Oldhand Coffee to create a unique blend of beer and coffee. We used whole Honduran Saul Vallecillo coffee beans to infuse this beer with a delightful hint of coffee flavour. Oldhand Coffee IPA is Coming Soon! An old favourite is making it's return soon. The Oldhand Coffee IPA was brewed this week and will be back on tap and in 4-pack 473ml cans soon! Stay tuned for more info. On January 27th we'll be tapping a Coconut Bourbon Porter Cask. It will be available on that day only, so don't miss out. Wings Food Truck will also be here all day serving up delicious eats for you to enjoy with your beer! 1Fish 2 Fish Pop-Up Shop Was A Huge Hit! We had such an amazing time on Saturday hosting 1 Fish 2 Fish in the brewery. Need something for the beer lover in your life this holiday season? We've got you covered. Stainless Steel Can Coolers & Tumblers from Arcticup. Our cooler is stocked with 15 Different Beers in Bottles and Cans. So whether you're buying for friends & family or treating yourself, chances are we've got something for you. If you're not sure what to get, a gift card is always a good option. From now until Christmas Eve, buy a $50 Gift Card and get a $10 Gift Card free! Hot Chocolate Porter Is Back! Back with a new look is our Hot Chocolate Porter. Taking inspiration from the traditional holiday drink enjoyed by family and friends our Hot Chocolate Porter is the perfect beverage for those long nights in front of the fire. We had a blast canning the Sumas Mtn. Lager with our friends at Mile 37 Canning. These new cans look awesome and we can't wait for people to get their hands on them! Ravens Brewing Company in Abbotsford released their Flying Dutchman North East IPA in early October. Inspired by the flavours of a rye sour cocktail, here is our take on a citrus rye sour beer.